Project Life, Feb. 21 - Apr. 24 (Tuesdays) – Next session presented by Bishop Doug Deshotel! In this Lenten season, as we all journey to find our way back to the Father, please join us in prayer for those suffering under the burden of abortion, including those seeking hope and healing at this weekend’s Rachel’s Vineyard™ Retreat. The popular culture remains resolute and largely of one mind in its defense of abortion. . . . Is there any other issue in the legal or medical field that Hollywood treats with such one-sided reverence? Well, all that is slowly changing. The growth in the audience for Christian-themed films has not escaped the notice of the Hollywood studios, which have finally come to understand that such films can mean big business at the box office. Doonby star John Schneider will appear for live interview and performance at The Bishop's 19th Annual Catholic Pro-Life Dinner on April 14 – Don't miss it! *Note: Technical difficulties with purchasing tickets online have reportedly been resolved by the theaters. 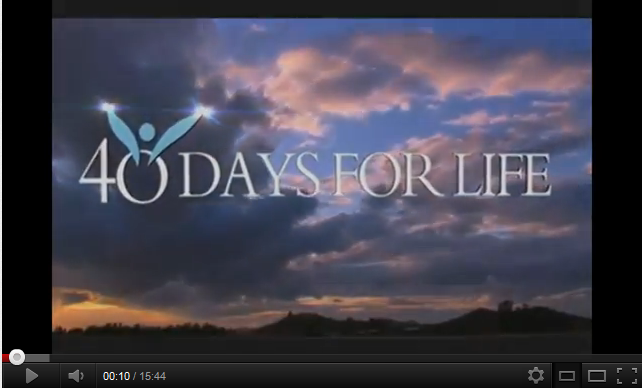 The largest-ever Spring 40 Days for Life campaign began this week. McKinney is hosting the only spring campaign in the Diocese of Dallas. 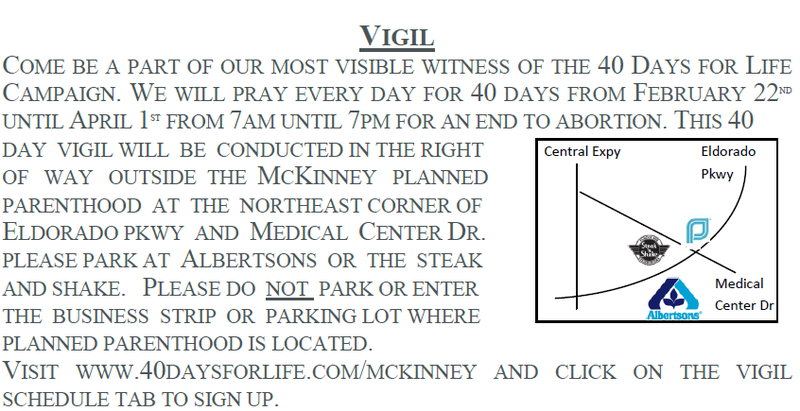 The McKinney 40-day Prayer Vigil is from 7 a.m. - 7 p.m. in the right of way outside the Planned Parenthood at the northeast corner of Medical Center Dr. and Eldorado Pkwy (map). For more info and to sign up to pray, visit 40daysforlife.com/mckinney. This year, we are pleased to focus recognition on one special hero of the movement, who will receive The Father Edward Robinson, O.P., Pro-Life Person of the Year Award. Please share with us who you think has best exemplified and evangelized the Gospel of Life. Click here to submit your nomination by March 1. You won't want to miss this spectacular evening, that's better than ever in so many ways! Don't wait – reserve your seat or table today. Send your email to Congress through www.usccb.org/conscience. This year Ash Wednesday isn’t just the first day of the Christian penitential season of Lent, it is also the beginning of the largest ever 40 Days for Life campaign. The massively successful international pro-life effort is set to launch in a record-breaking 258 locations in the United States, Canada, England, Australia and Spain. The peaceful campaign unites pro-life advocates around the globe in 40 days of prayer and fasting, constant vigil in front of hundreds of abortion clinics, and community outreach. Continue reading. For more information about Planned Parenthood, see prolifedallas.org/plannedparenthood.